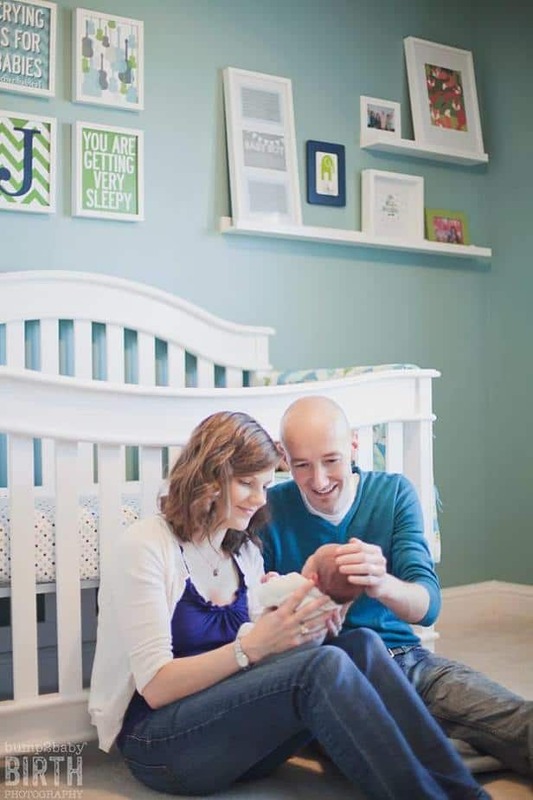 K and J began care with me at 8 weeks along in their first pregnancy. They were really excited about having a home water birth. Her pregnancy progressed beautifully. K and J took Bradley Method childbirth classes, hired a doula and a birth photographer. They were well prepared and educated on every decision along the way. For most of her pregnancy, K said she wanted to have baby Joel +/- 2 days of her due date, which was January 19. January 21 came along, and K was in for her 40 week prenatal appointment. We did a cervical check and found her to be 2cm dilated, 70% effaced and baby at a -1 station. K asked me to sweep her membranes, and she easily opened to a 3. I sent her home to eat dinner, walk and rest and keep me updated if contractions began. The next morning, K text me saying she lost her mucus plug and was having regular contractions every 10 minutes. Around noon, J emailed me her contraction timer report and K asked me if it was time to ask her mom to come from north Texas. I looked at the pattern and said not yet. Contractions were irregular, every 5-10 minutes and short. It was hard to know, but chances were that it was still early. A couple hours later, K text that her contractions were coming every 2-6 minutes and lasting longer. She was going to see her chiropractor and then I told her she could come for a labor check and another sweep and see if it put her into active labor. Cervical check found her to be 3/80/-1, and easily swept to a 4. Her contractions looked moderate in intensity and were coming every 2-4 minutes as they prepared to leave my house. I instructed them to keep in touch and call me to come when they made the switch into active labor, as well as call her mom to come. It was a Wednesday evening, and my husband is a youth minister. K left my house a little after 5, so I expected that they probably would not need me until after my husband came home. At 6:34 (yes, I know the minute on this one! ), J calls and said K was in very active labor. I scrambled getting my boys together, dropped them off to the hubby at church and was at J and K’s house at 7pm. I found K in obvious active labor. Contractions were coming every 2-4 minutes, and lasting well over a minute long. I found her doing hands and knees on her bed when I came into her room. I quickly got the birth pool set up and J started filling. We did a cervical check to see where K was at now that she was in active labor. She was 4cm/90%/-1. Good change in a short period of time. For the next hour and a half, K alternated positions. She was very in tune with her body, alternating from hands and knees, to left side lying. To the toilet. Her doula arrived during this time, and offered counter pressure and soothing words of encouragement. As 9pm drew near, we had the birth pool ready for K. She readily got in and melted into the warm water. Her labor play list was playing in the background, candles lit and the room lighting was dim. K labored quietly, riding the wave of each contraction. Quarter after 10, I encouraged K that she needed to empty her bladder. Toilet contractions are always helpful to the labor process, so we were hopeful that a change of position would be good for her too. She labored on the toilet for a few minutes, then moved to her big, soft rug in her bathroom, laboring in hands and knees. In between a contraction, K looked up at me and asked, “When will my water break?” K began crawling across the floor from her bathroom, into her bedroom, her eyes on the birth pool. She would pause to breathe and rock through a contraction. Around this time, K’s mom arrived. As K made it near her bed, she exclaimed, “I am peeing myself. Or it is my water. I don’t know.” A normal amount of clear fluid flowed onto the shower curtain that her doula so kindly placed on the floor. She got her wish. Her water was broken. Quarter to 11, K got back into the birth pool. Moments later we did a cervical check in the pool. K had an anterior lip of cervix remaining, her cervix was completely effaced and baby was engaged at a 0 station. Pushing was near! 1109 K stated she thought she might have pushed with the last contraction. Sure enough, the next contraction brought spontaneous baring down. She started pushing laying on her right side in the pool, followed by semi reclining. She pushed perfect with each contraction. We could see more and more of his head each time. 1121, K was completely dilated and effaced and baby was at a +3 station. Minutes later, J got in the pool to help support K while she pushed. At 1140, the baby’s head began to crown and minutes later she pushed her baby into the awaiting birth pool. I unraveled his cord from his neck and brought him up to K’s chest. We used the bulb syringe to clear some of the fluid. J and K held their baby in awe. We joked that God was only off by a day, that he missed the +/-2 days memo, and confused it for +/-3 days! He was here! He was perfect, and born peacefully and gently in the comfort of his home. Welcome to the world Joel! Born on January 22, 2014 at 1143pm, weighing in at 7.4#, 19.25″. So honored to have been part of Joel’s birthing day.